Customer support - Users indicated that a knowledgeable and efficient support team is something they value in digital asset management software vendors. The top DAM products on G2 Crowd reflect that trend. With a category average "quality of support" score of 88%, the majority of Leaders and High Performers received an above average "quality of support" score from reviewers, while the majority of Contenders and Niche solutions earned below average "quality of support" scores from reviewers. Customization and setup – Users indicated that an important quality in digital asset management software is the ability to customize how the software platforms organize their digital media. While customization is important, users indicated that it can be time consuming and, at times, complicated. This might be why the category average "ease of setup" score of 80% was the lowest user satisfaction average of the category. However, the majority of Leaders and High Performers received above average Ease of Setup scores, while the majority of Contenders and Niche solutions received scores below the average. This might suggest that while customization can be time consuming, the products that make the customization process easy have higher user satisfaction. 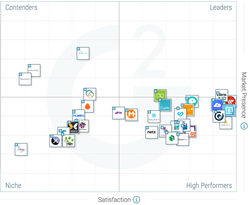 Of the 114 products listed in G2 Crowd’s Digital Asset Management category, the ranked products each received ten or more reviews to qualify for inclusion on the Grid.